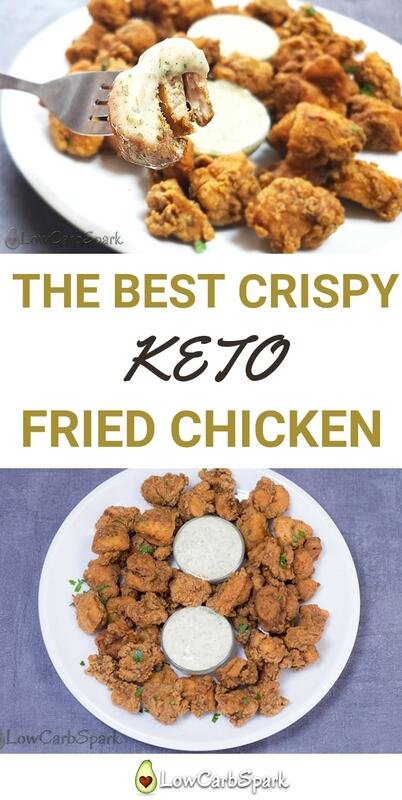 Keto fried chicken or chicken nuggets are crispy, spicy, super easy to make, perfect for lunch or as a low carb snack. I’ve been a KFC style chicken fan for a long time. The best part is that sometimes I still enjoy homemade fried chicken, a recipe that in my opinion resembles and tastes even better than the one you buy. When cooking at home, even fried dishes (that are higher in calories) can be healthier. You can choose the frying oil, the coating, adjust the seasonings, omit the sugars and other nasty ingredients. 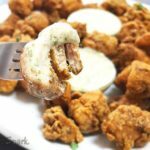 Today I am showing you my favorite keto fried chicken recipe dipped in ranch dressing. You can also serve them with sugar-free ketchup or a simple salad. But, be careful these golden little chicken pops are addictive. I haven’t yet met someone who doesn’t like crispy on the outside and moist on the inside fried chicken. 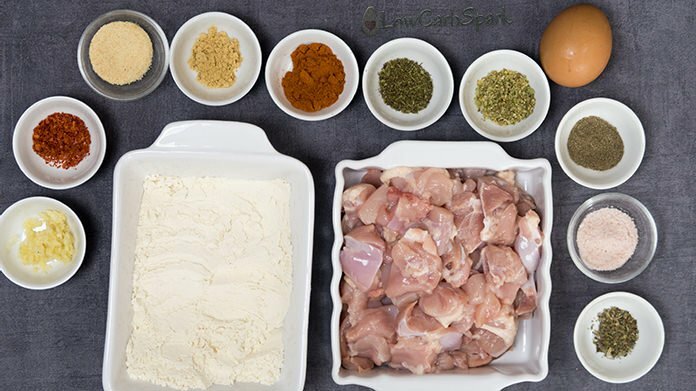 The secret to a perfectly seasoned chicken is to marinate it in many herbs and spices before frying it. I recommend you keep it overnight in the fridge so the meat can absorb all the flavors. There’s no problem if you don’t have that much time to wait. An hour in the fridge is enough to get the chicken ready. You’ll see that this is a super simple recipe that requires less than 20 minutes of work. After the meat is ready to coat and fry all you have to do is to wait for it to be done or to prepare a delicious dip or a simple low carb salad. The ingredients you’ll need in this keto recipe are not crazy and you can easily find them. 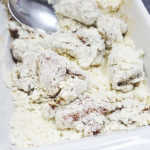 To coat the chicken bites, I used almond flour but an unflavoured protein powder works well too. Some people use coconut flour or coconut flakes but I am not a huge fan of those. One thing I tried and really loved are the pork rinds processed into little pieces. What oils are good for deep frying? You may know that not all the oils are good for frying. You should choose oils that have a high smoke point and are stable when heated. Coconut oil is one of the best choices when it comes to deep frying. Try a refined coconut oil that has no taste. Animal fats like lard, tallow or ghee are great a good choice. They taste amazing and add extra flavor to the recipe. Avocado Oil has a high smoke point and can be used for deep frying. Peanut oil has a neutral taste and a high smoke point (446°F / 230°C). Palm oil is excellent for deep frying but not recommended. 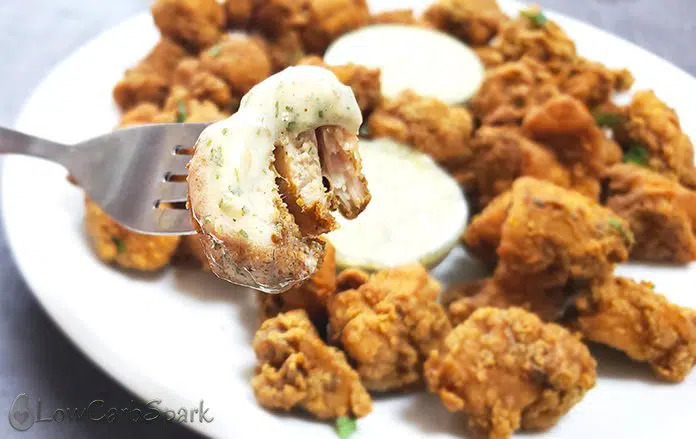 Keto fried chicken bites are super delicious, easy to make and very low in carbs. Perfect for a quick low carb snack and delicious with a side salad or a high fat sauce. Cut the chicken into bite-sized (1-inch) pieces. 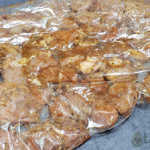 Place the chicken into a zip-lock bag or into a bowl, add one egg and all the spices. Toss to coat well on all the sides. Let it marinate in the fridge for at least one hour. Add the almond flour or protein powder in a container. Put the chicken pieces in the container and toss to coat well. Heat enough oil in a deep pot. 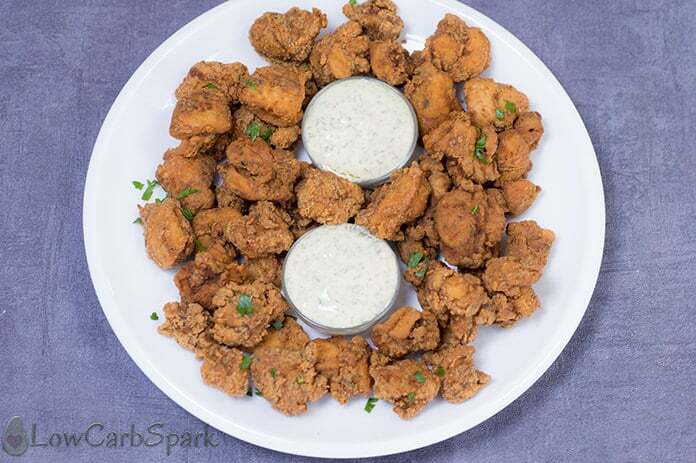 Fry chicken bites, several pieces at a time, for 5-6 minutes, until golden brown. In a deep fryer, heat oil to 375°F. 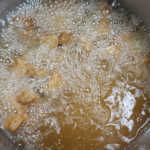 Fry chicken bites, several pieces at a time, for 5-6 minutes, until golden brown. Serve with your favorite side salad or a delicious keto sauce. Can I do this in an air fryer?